This gorgeous 4,100 sq ft property has been renovated into a spectacular Sun Valley Vacation Lodge with 5 Bedroom suites, A/C, wood burning fireplace, and a huge, 2,350 Sq Ft deck overlookng the Elkhorn Pond. Guest have access to the Elkhorn community amenities including the Hot Tub and seasonal access to Pools, Tennis, and discount to the Elkhorn Golf Course- all of which are literally steps away from the property. Additionally, the shuttle stop for Mountain Rides (free transportation) is across the street from the property, with routes to Bald Mountain, Dollar Mountain, Sun Valley Lodge, and downtown Ketchum. Originally built as a restaurant, this stunning remodel features gorgeous vaulted ceilings with exposed rafters, an open floor plan and stunning views. LIVING AREA: Centered around the custom two-sided gas fireplace, the living area features a leather couch and 4 over stuffed chairs, flat screen tv, and an additional sitting area overlooking the deck and pond. DINING AREA: Adjacent to the Living Area, the dining area features a huge dining table with seating for 10. BAR/LOUNGE: Located across from the Living Area, the bar and lounge area enjoys the custom fireplace, a flat screen tv and game table. KITCHEN: The small galley kitchen includes all the essentials for preparing a meal. OUTDOOR LIVING: The 2,350 square foot deck with gas grill, overlooking the Elkhorn Pond is an extraordinary feature and is perfect for a small event or just relaxing under the sun. The deck is furnished in the summer/early fall only. BR 1: King Suite with Flat Screen TV, and En Suite Bath with shower/tub combo. BR 2: King Suite with Flat Screen TV, direct deck access, and En Suite Bath with shower/tub combo. BR 3: King Suite with Flat Screen TV, and En Suite Bath with shower/tub combo. BR 5: Bunk Suite with 2 sets of bunk beds (4 beds total), Flat Screen TV, and En Suite Bath with shower/tub combo. Free Wifi, ample parking, and 2 sets of washers and dryers are available for guest use. From friends to families to executive retreats, the Elkhorn Inn has something for everyone! Small events may be considered and must be pre-approved by owner. Use of the on site commercial kitchen for professional chefs / catering companies will be considered and must be pre-approved. Proper liability insurance is required. Additional fees will apply. 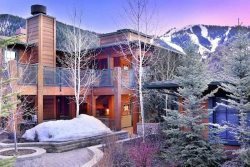 Located in the city of Sun Valley, Idaho on the south side of Dollar Mountain, Elkhorn vacation homes and condos enjoy panoramic views and easy access to the Sun Valley Resort, Dollar Mountain and Ketchum. Elkhorn Guests receive privileges to Elkhorn Pools, Spas, Sauna and Steam Room as well as discounts to Elkhorn Golf and Tennis.